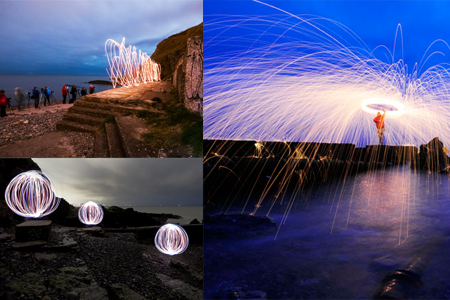 Join us and other photographers for an evening of light orbs, steel wool and lasers on a small secluded beach in Bray. This location shoot will allow you to bring out the more creative side of your photography. Learn how to capture and create fountains of fire and orbs of light and come away knowing the basic equipment needed and the finer points of nailing down your techniques. This is trick photography at its best. A DPS tutor (2 tutors if group is larger than 9 students) is on hand and demos with tips and techniques will be given throughout.